Please refer to our stock # TC185 when inquiring. During the Qing dynasty, carved wood blocks were used to produce the ancestor portraits which decorated the homes of many Chinese families. The Chinese translation of the term "ancestor Portraits" can be misleading to Westerners. These were not portraits of the particular family's ancestors. They were portraits of various Chinese officials, emperor, empress, etc. for whom the family wished to show respect and or allegiance. 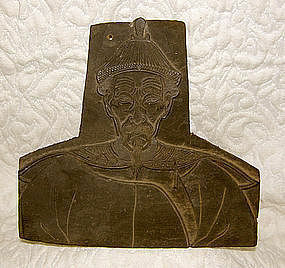 This stencil is approximately 9" by 9" and has some calligraphy on the rear for identification.